Presidential Nominee Barack Obama took only 14 words to effectively ‘put paid to’ the idea that a third Palestinian State - in addition to Israel and Jordan - will be created during his term as President if he wins the forthcoming election in November. Mr Obama - like President Bush - has now given his unequivocal support to Israel’s rejection of the 40 years old demand by the Palestinian Liberation Organisation (PLO) - endorsed by the 22 member States of the Arab League - that millions of former Arab residents or their descendants be allowed to emigrate to Israel. Arabs already comprise 20% of Israel’s existing population. They all are Israeli citizens enjoying the same rights privileges and opportunities open to the Jewish majority other than being required to serve in the armed forces. Israel is understandably reluctant to allow the Arab sector of its population to expand other than by natural growth. No political party in Israel espousing a contrary view would have any hope of gaining Government. 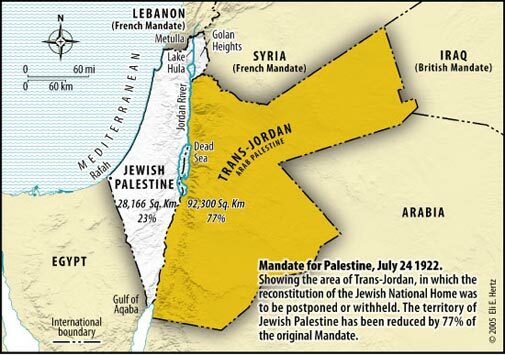 Agreeing to such a proposal would in a very short time destroy the Jewish identity of Israel and its Jewish majority presently living there and replace it with an Arab identity and an Arab majority. The reason for this long standing Arab demand being maintained is writ large in the Charters of both Hamas and the PLO. It is considered as the political means by which Arab sovereignty can be established for the first time in history in the totality of Palestine - where at present Arab sovereignty exists in 77% - today called Jordan..
For Hamas - the Islamic Resistance Movement - that right of return is non- negotiable and inviolate and will be pursued until the complete destruction of Israel’s identity as a Jewish state is achieved . “The Islamic Resistance Movement believes that the land of Palestine is an Islamic Waqf [an inalienable religious endowment - author ] consecrated for future Moslem generations until Judgement Day. It, or any part of it, should not be squandered: it, or any part of it, should not be given up. Neither a single Arab country nor all Arab countries, neither any king or president, nor all the kings and presidents, neither any organization nor all of them, be they Palestinian or Arab, possess the right to do that”. Any attempt therefore by any Arab leader to abandon negotiate away or compromise on this issue would bring swift retribution from Hamas. Article 1 of the PLO Charter - whilst not as strident or inflammatory in its language - makes it clear that Palestine is an Arab homeland - not Jewish . No amount of soothing words or diplomatic nuances can bridge the gap that these written words have created for the negotiations that have been ongoing between Israel and the Palestinian Authority with very little success for the last 15 years. When push comes to shove this claim to Arab ownership of Palestine to the exclusion of the Jews will bring any negotiations crashing down to an ignominious end, since American support for the Arab position is absolutely essential if any kind of pressure is to be put on Israel to moderate its opposition to the demanded right of return. Israel has long offered to resolve the problem by entering into negotiations for the payment of compensation. Such negotiations however would also need to address compensation claims by Jews expelled from Arab countries since Israel’s creation sixty years ago. It would take a very brave Arab leader to agree to such negotiations. His shelf life would be very short and his use by date would soon expire. An Israeli proposal in 2000 to allow up to 100000 Arabs to return to Israel was firmly rejected by the Arabs. It is unlikely to be offered again given the radicalisation of the Palestinian Arabs since then.. This issue has been one of the major stumbling blocks to President Bush’s Roadmap failing to even make it to first base despite the backing of the European Union, Russia and the United Nations. No doubt conferences, negotiations, press releases and Presidential statements will continue to flow until a new American President is in control and will continue throughout the next Presidential term of office but nothing tangible can possibly emerge until the Arabs drop their demand for the right of return. For that to happen would also require a miracle. The region is replete with miracles that form integral parts of the Jewish, Islamic and Christian faiths. However any hopes that either or both of these current two miracles-in-waiting will eventuate is sheer folly. I right it "anonymously" because of my sordid past and various, mainly past, natsec, entanglements unrelated to the Southern Hemisphere.